A superb effort from underdogs Porto saw the Portuguese side stun German giants Bayern Munich in a day to forget for Pep Guardiola's team. Just two minutes into the game, distaste struck for the away side. Martinez robbed the sloppy Alonso on the edge of the box and found himself in on goal with Neuer. The Porto striker took a few strides, swept to the right and was bundled over by his German opponent. Straight penalty, and it could have been a red card but referee Carlos Velasco Carballo let Neuer off the hook. The Bayern goalkeeper knew he messed up big time. Ricardo Queresma stepped up... and fired low into the bottom left hand corner, sending culprit Neuer the wrong way. Massive, massive goal for Porto. The usually dominant Bayern fired back, and a swift cross from the left side almost led to an equalizer. Muller met the ball at Fabiano's back post and cushioned down to Lewandowsi who unfortunately pounded his header over the bar. Xabi Alonso payed a big price for being sloppily dispossessed, and Dante clearly didn't learned from that. As the away side controlled possession at the back, the Brazilian was robbed by Queresma and Neuer faced another one-on-one battle. With a second goal in sight, the Portuguese winger toe-poked home to double Porto's lead. The home side implemented a rapid pace and Guardiola's men just couldn't handle it. A long ball was whipped towards the dangerous Jackson Martinez; he controlled, turned but his left-footed strike blootered over the crossbar. Nowhere near the target, but it emphasized Porto's freedom of play against the bewildered Bayern. The visitors were being pinned in their own half, and even when they did try and mount an attack, Porto squeezed out any danger. Muller was the prime example. The German was helplessly targeted on numerous occasions and couldn't put goalkeeper Fabiano under any pressure. Things would change just after twenty minutes, though, as Bayern enjoyed a comfortable spell in possession. Knocking it around the park like true professionals; Guardiola's team had Porto pinned in their own half at some stages. Fabiano wasn't threatened in goal, but it looked more promising for Bayern. The visitor's solid spell following Porto's early rampage was half repaired, courtesy of Alcantara. The move began with Lahm as he threaded through to Boateng on the right wing, and then somehow the centre-back's low cross flew past every defender and Alcantara was there to slot home from close range and give Bayern a much-needed goal. It was coming, too after a solid spell in possession. Neuer had a torrid first half and it almost got worse after Sandro's cheeky effort at goal. Scorching down the left flank, he whipped an effort over the German goalkeeper's head, nearly scraping the ball into goal but a vital touch by Neuer would knock it onto the crossbar and back out into his grasp. Very audacious effort, and it almost payed off. The half time whistle sounded and to the players' credit, the first 45 were filled with pulsating action. Queresma's early rampage put Bayern two down inside ten minutes, but as the game grew into the later stages of the half, Guardiola's men fought back and managed to grab an away goal. Porto opened the second with a high tempo, as Queresma rolled past Bernat, diverted on his left, then back onto the right until his cross blootered past every player in the area. Brahmi scampered down the left, and swiftly approached the left byline until his attempted cross took a deflection and bundled out. The corner came to nothing, but nevertheless it was a sharp start to the second from the home team. Bayern's two silly mistakes in the first ten minutes is what cost them two goals. Alonso, who was robbed; leading to Neuer giving away a penalty, was in the limelight again as he almost allowed Porto in on goal. The Spaniard slid to the floor but stuck a vital leg out to thwart his man from escaping. Porto fancied a third, and almost got one if it wasn't for the brilliance of Neuer. The home side mounted an attack down the right flank, and a scintillating low cross found Herrera, who only needed a deflection to convert at close range. He got one, but Neuer's excellent reflexes allowed him to react quickly and bundle the ball over his crossbar. After replying with a much-needed away goal, Bayern threw it all away with yet another howler. A long ball was launched up top, with Boateng looking fully set to head clear. But he doesn't. The German completely mistimes his jump and the ball bundles behind him for Jackson Martinez to retrieve. He strode forward, swept past Neuer and slotted home on his left foot. Superb composure from the Colombian, not only to seize possession, but to calmly take it past his German opponent and treble Porto's lead. Sebastian Rode had been playing well ever since he replaced Gotze, and the 24-year old unleashed a sharp curler on the end of some superb link-up play further emphasized that. The chances of Bayern scraping a draw were very unlikely, but the young German continued to impress. The visitors managed to calm Porto's rapid pace at least, but every time they attempted to create chances, the excellent defensive work of the home side blocked them out. It was turning into a night to forget for Guardiola's team. 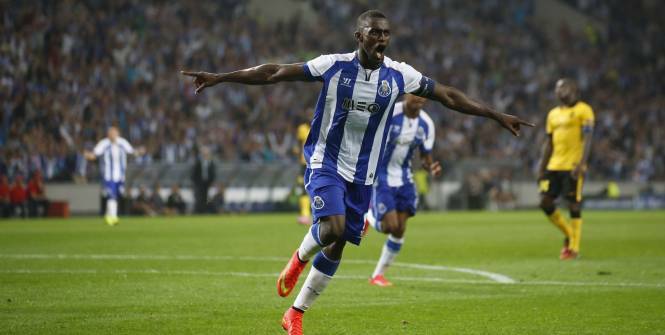 Due to right back Danilo being booked, Porto will travel to the second leg in Munich without their two first choice defenders with the earlier booking. Despite Bayern needing a couple of goals to draw level, it's a blow for the Portuguese side. A frustrated, dismal look on Pep Guardiola's face told the whole story. Bayern just simply weren't good enough. Porto goalkeeper Fabiano only had a couple of shots on target to deal with, and considering the attacking strength the German giants have, that is quite worrying. The full time whistle blew, and a raucous ovation erupted inside the Estadio de Dragao as Porto hit three past Bayern Munich in a superb performance. Amazing moment for the club, players and fans. But... can they hold their nerve and see it through at the Allianz Arena?